← What To Do With All Those Soap Pieces? 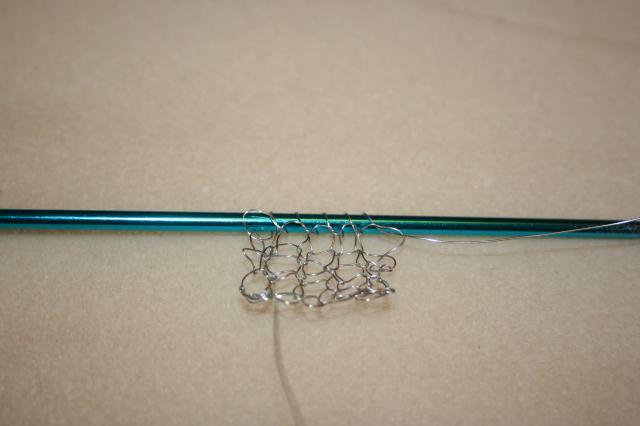 Before leaving New York a friend of mine wanted to learn how to knit with wire. 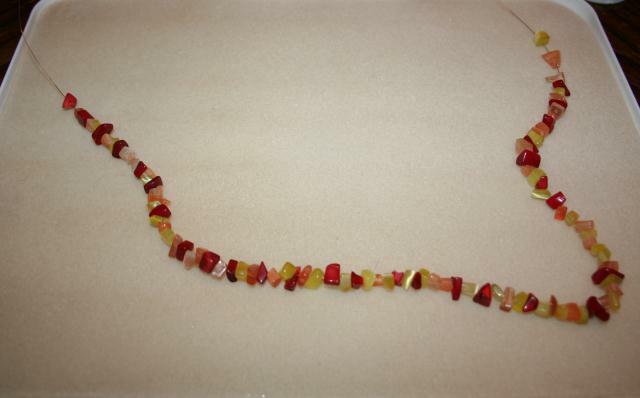 My friend, Carla, is an incredible beader and I wish we had more time so that she could have taught me how to make one of her creations. I wasn’t sure we were going to be able to fit it in – but since her daughter was coming to Stella’s going away hurrah party – she stayed! I was so glad that she did – so that I had some adult company instead of just 9 kids. 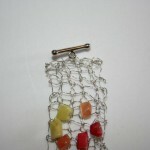 Carla started off thinking she was going to knit a necklace, but in the end she knitted a bracelet. 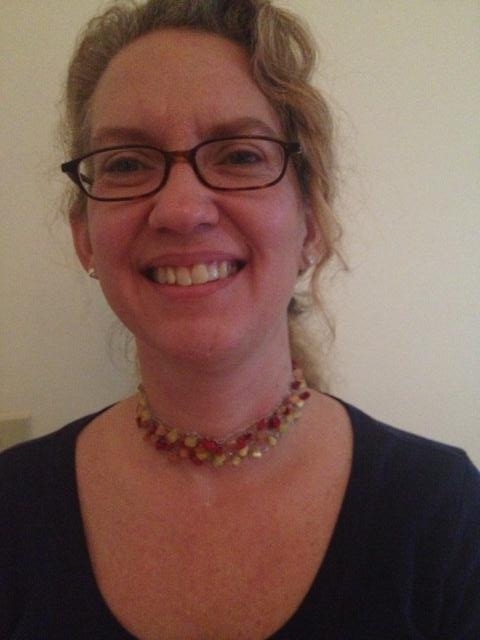 I did do a necklace – but finished once we made it to Virginia. Carla is a tight knitter, but loosened up towards the end. She was so good and that same night she finished it at home! I love crafting with others and it is especially nice when I can teach someone something new or that I am taught something new!! 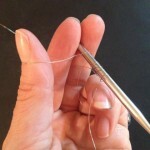 I am hoping to learn many new crafts now being in the mountains of Virginia – basket weaving, wet felting, crochet and to better be able to use my serger – that definitely does not get the use it deserves!! 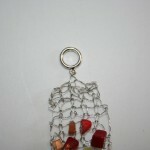 The smaller the gauge of wire the stiffer the wire. For the necklace I used 28 gauge. 1. 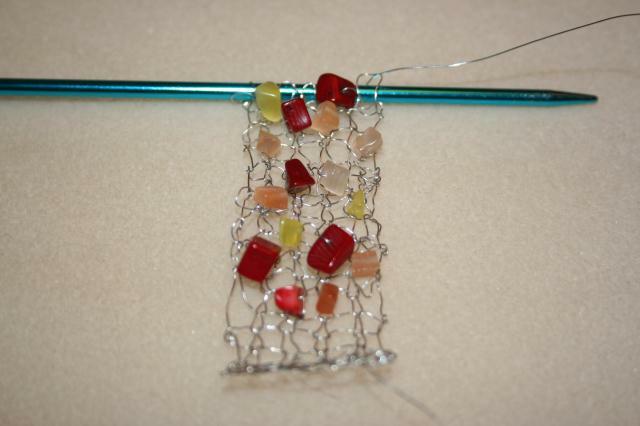 String your beads onto the wire. 2. Cast on 5 stitches. 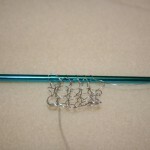 Make a slip knot and place on your knitting needle. 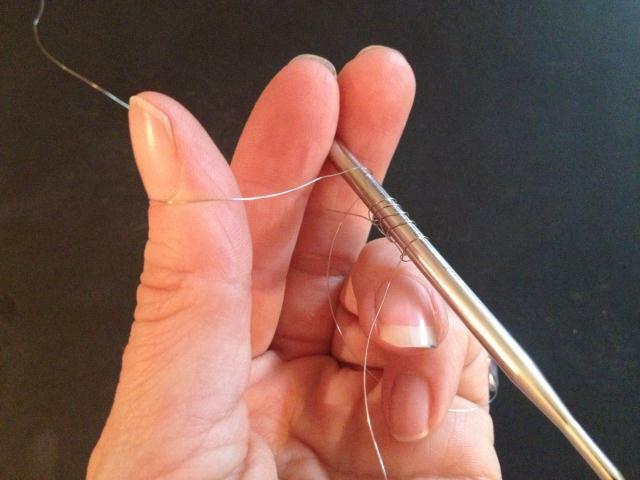 Then cast on using the Thumb method. 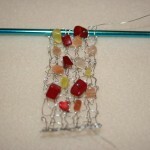 Row 8: This where I started using my beads and making a pattern. K2, bring a bead up, K1, bring bead up K2. 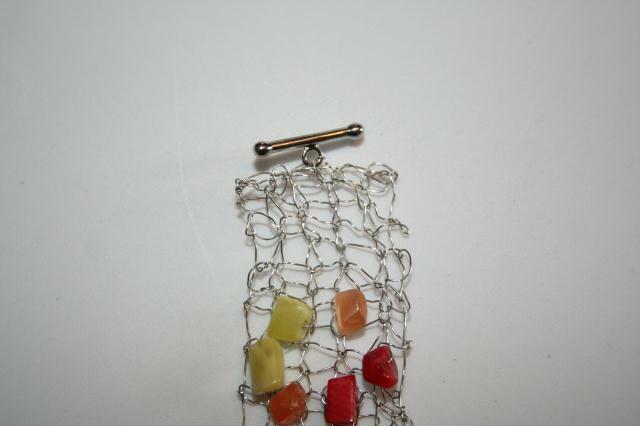 The bead, depending on the size with either lay above the knitting or in the loop between the two stitches. 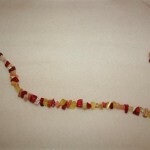 Row 10: K1, bring bead up, K3, bring bead up, K1. Repeat Rows 8 – 11 to create this pattern or create your own pattern. End by knitting the last 7 rows and then bind off. 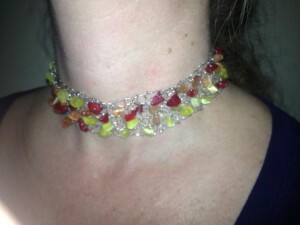 I wanted my necklace to be more like a choker, and it measured 12″ without the clasp. Depending on what you are wanting will determine the length. 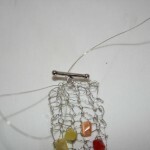 Weave in the wire on the cast on side, half way across and then attached your clasp – weave to the end and then weave the wire down some before cutting. 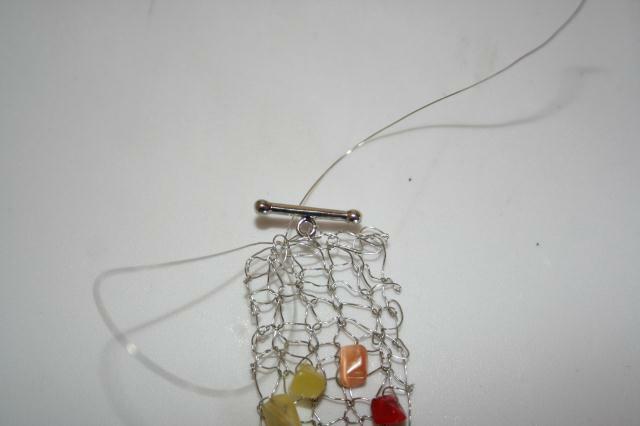 On the bind off side, weave the wire to the half way, attach clasp securely, and then weave the rest of the wire into the necklace. I wasn’t sure how this would feel against my neck as a choker – I thought maybe the uneven edge would not be comfortable. 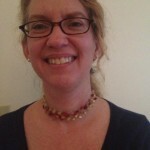 I have to say that it feels really good and I forgot that I was wearing it – it does not feel constricting at all! 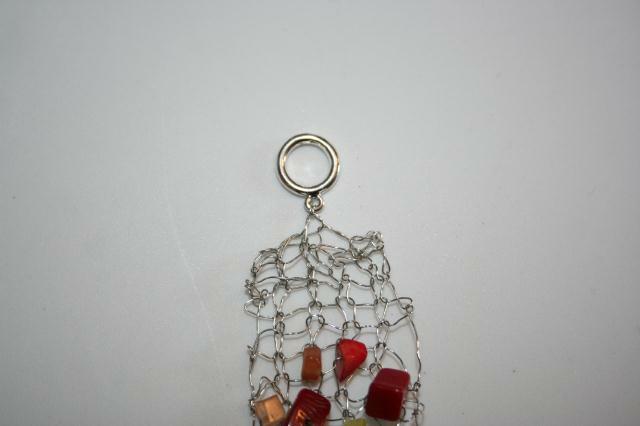 This entry was posted in Crafts, Jewelry, Knitting and tagged crafting, knititng, necklace, wire. Bookmark the permalink. Stunning:) and the necklace is beautiful too!